Fusion: My life as a professional kite pilot | Kite Stop | Kites, Windsocks, Yo-Yos, Flying Toys and more. 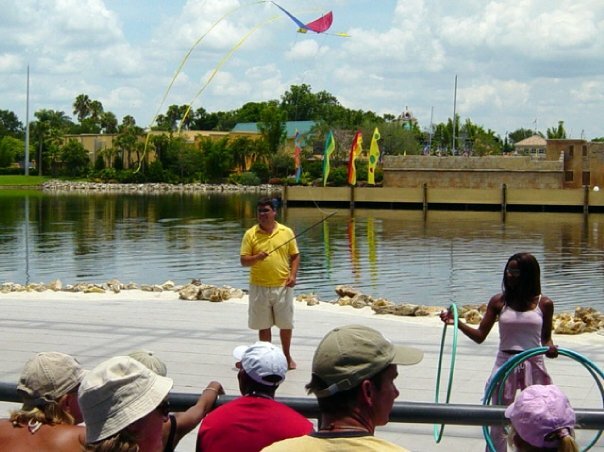 When I received an email from the Region 4 Director of AKA trying to find available stunt kite pilots in the Orlando area to fly in a lagoon show at Sea World, little did I know what I was getting into. This was a dream opportunity. How often do you get a chance to fly kites AND get paid for it. So I emailed Bruce Flora of Kiteman Productions and got a chance to live everyone’s dream job for the summer! Let me start out by saying, I have never been involved with the entertainment business. So the idea that I would have to “look the part” and “audition” is a foreign concept for me. I had to meet with the Executive Producer and Creative Director before even being considered for the job, just so they could “approve” of my look. Luckily, the part I’d be playing is out on the water, and thus the “look” portion isn’t as strict. Auditions had already been held, but they were in desperate need of a stunt kite pilot, so I got special treatment in pushing my paperwork through. The Show was to start in just 3 weeks, and there was drug testing and other corporate paperwork that needed to be done before I’d even be allowed on Sea World property. Everything went smoothly and I was able to get pushed through the process rather quickly. Training was being conducted on a lake in the Kissimee area. As I was a late hire, I kind of got dumped into the training program with little preparation. Most of the people that I was training with had been veteran show skiers and boat drivers, who had done the “show” thing once or twice before (read: ALOT of shows) and knew what they were getting into. I, on the other hand, had just flown stunt kites at the beach. Luckily, I was able to quickly adapt. I knew I wouldn’t have any trouble with the kite flying, but the setup and “docks” (setting up equipment and props) are another thing. Kiteman Productions have developed a lot of proprietary equipment for launching and attaching kites to Sea Doo’s, and that all took a bit of time to learn. I had to learn how to roll up kiteline on yo-yo winders (yeah, it seems easy, but there really is a technique to it so that it comes off cleanly) and stuffing tails quickly, but in such a way that they don’t get all tangled up when we launch. Flying also takes a bit getting used to. 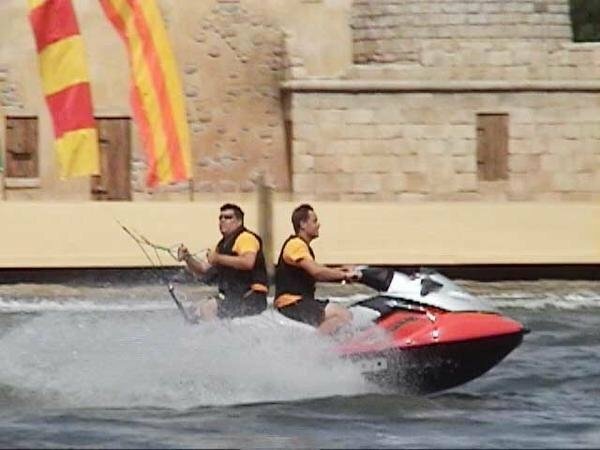 I don’t think its actually flying the kite, but riding backwards on the Sea Doo that takes the most getting used to. Flying is essentially the same, but you have to be more attuned to the manuevering of the Sea Doo, and how that effects the windflow. Imagine if you were standing on the beach, flying your kite, and the wind shifts a direct 180. If you’re not prepared for it, your kite will crash. And crashing in the water isn’t so much fun. Not only do the skiers jeer and make fun of you “OH, the KiteGuy can’t even keep the kite in the air…” but during a show situation, it is VERY bad. Anyway.. they started me out on a “small” stunt kite (A Prism Legacy) to toy around with and get used to the idea of flying while riding a Sea Doo. Then it was on to the 5-stack of 6ft Diamond kites. Then on to the 16ft Delta. Ok, I must admit that it took me a good 5-10 flights before I felt comfortable. After our training, we went out to Sea World for practice. The lagoon we’d be doing our show in, was rather small, and the areas where we were “authorized” to fly made for some tight spaces. No flying over people, boats or objects. All of our patterns had to be approved by the corporate folks at Sea World, so if we felt like a change was needed, it wasn’t like we could just go and do it, we’d have to draw it out on a sheet of paper, submit it to the proper people, who’d submit it to the proper people, and so on.. Until it came back to us approved. Practice consisted of the entire cast memorizing the sequences of the show, and their parts. We had dancers, high divers, skiers, kite pilots, boat drivers, and even birds and dogs. Everyone an essential part of the show, as if anyone goofed up, a whole scene of the show would be impacted. First people would practice their individual parts, and then sequences would be practiced until we were able to do the whole show. Our cast managers were extremely good at keeping us on track. The show opened the first weekend of May. Now, doing a regularly scheduled show isn’t as much fun as just going out and tooling around on lake. Granted, its quite fun, but after the first 50 or so shows, its starts to become a job. A fun job, but a job none-the-less. So what does an average day consist of? First off, our call-time and number of shows per day is determined by Sea World. It is based on the forecasted attendance for that day. Usually we perform 3-4 shows a day. First thing upon arrival, we get changed into our “work” uniform, which usually consists of a pair of swim trunks and a t-shirt. We pre-set all of our costumes and props for the show. Usually this meant that we grab our PFD (personal floatation device) and different shirts/hats, and put them where we would need them for different show sequences. About an hour before the first show, we would have an all-hands meeting to discuss any issues in safety, show performance, etc. Next, as a group, we would stretch our bodies. (some more than others, as the dancers are MUCH more limber than us kiteflyers). Then it’s on to kite setup. When we first started, we had to use portable kite launchers, which meant that every morning we would have to get a barge boat, and ferry our launchers to where they belonged on the shore. We eventually got some permanent launchers and this step was made SO much easier! We would setup the 5-stacks and then the Deltas. This takes about 30-minutes. Then its on to show time. Now, I’m not going to go through the whole show, but suffice it to say, its a quick 20 minutes.Everyone on the cast is on the move for the entire 20 minutes. While the kiteflying sequences might only be 3 minutes, we also do double duty as ski-spotters. Once the show is over, we go back and reset all the kites and get ready for the next show. Generally, there was about an hour or two between shows, which allowed us to get lunch and cool down. Because, remember, we’re out in the Florida sun in 90-100 degree weather most of the time. But don’t be too sorry for us. Its a great job. I got a great tan (ok, I no longer have a “farmer’s” tan, but I do have tan lines where my life-vest is). Hurricane Charley shortened our show. Because of damage to our stadium, we ended our show in mid August 2004. I have continued to do shows with Kiteman Productions, that have included me flying kites around cruise ships, during air shows, and most recently in the middle of the World's largest fireworks show in Kuwait.